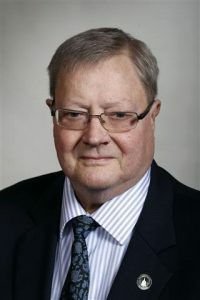 Greg Forristall, a Pottawattamie County Representative to the Iowa House, passed away yesterday. A farmer from Maceadonia, Forristall was first elected in 2006. Greg was born in Council Bluffs and grew up on the family farm near Macedonia and attended Carson-Macedonia schools where he graduated in 1968. He went on to attend the University of Iowa, graduating in 1972 and earned a Master of Arts degree in 1973. Greg married Carol in 1978, and she taught music in Iowa public schools for 35 years. Greg had been active in the community with organizations such as the Council Bluffs Sister Cities, Farm Bureau, the Iowa Corn Promotion Board and the Iowa Western Community College Board. He had been a member of the United States Grain Council and served on the Iowa State Board of Education, the Iowa Western Community College Board and the Iowa Community College Council. Illness kept the western Iowa lawmaker mostly absent from participation in the 2017 session. He was 67.